Today—January 5—is National Bird Day. Established to raise awareness of the issues affecting avian populations around the world, National Bird Day brings public attention to the welfare of birds living in captivity, bird breeding mills, and other such topics. In the spirit of this feathered holiday, we highlight an engraving by French printmaker Simon Charles Miger, titled Ostrich. Created at the turn of the 19th century, this print was published in La Menagerie du Museum National d’Histoire Naturelle—a scholarly work that surveyed and catalogued various animal species on display at the Museum National d’Histoire Naturelle in Paris, France. 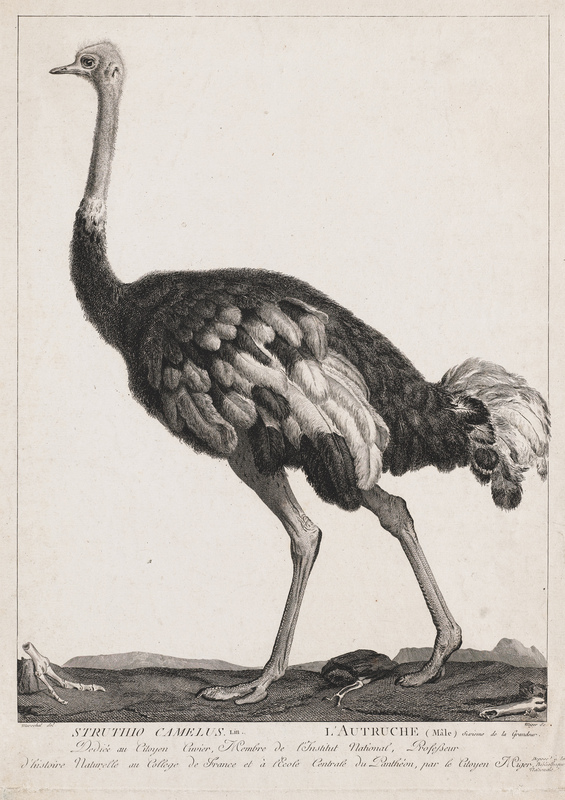 The 1801 engraving depicts an ostrich, with its long limbs and feathered body, strutting across a landscape reminiscent of the bird’s native Africa. Rendered in profile, the bird occupies the majority of the composition, making clear Miger’s interest in foregrounding its anatomical likeness. While La Menagerie indeed illustrates animals who were at the time living in captivity, its production points to important advances made during the Enlightenment, a time when European interest in the natural world grew significantly. Like other artist-naturalists John James Audubon and Alexander Wilson, Miger made important contributions to our understanding of the natural world, producing works that supported the then-burgeoning conservation movement.